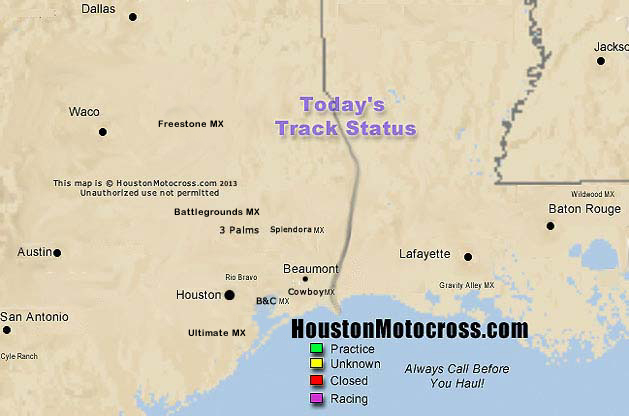 The following map and list contains tracks currently covered by HoustonMotocross.com. We try to update Houston local track status at least once a day, or as changes are required. Weather conditions are monitored real-time, providing not only previous two-day rainfall amounts, but also the current weather and forecasts. Clicking on a track name provides even more detailed information about the track. We do not cover ALL tracks, but are making an attempt to keep up with the best. Please keep us informed about errors in current conditions or to let us know about additional tracks to cover by using the links just below. HoustonMotocross.com is not liable for track information presented on this website, as it is only provided as a guide. When in doubt, always call before you haul! Tell us about a track. Notify us of an error in status! Click Here!. Wed. 9 a.m.- 9:30 p.m. The rest of the days we will be open from 9-dark. MARCH 20TH Houston Holeshot RACE!! We are closed for Practice, only events until further notice. As of 3-26-2012 new hours. We now offer Learn to Ride Program with Bikes and gear Provided all ages. As always call the track line @ 936-321-8725 before you come out to the track. Track hours are subject to change. Please note practice hours are subject to change due to weather or race schedule. Always chech our park hotline @ 936-321-8725 Even if the message is "Dated" or old, trust the recorder, we will always try to stay on top of it. Organized practice on Saturday for bikes and quads and the fee is $12. Sunday is for bikes only on the track. The fee is $15. (Quads are allowed on the trails and mud pit on Sunday).